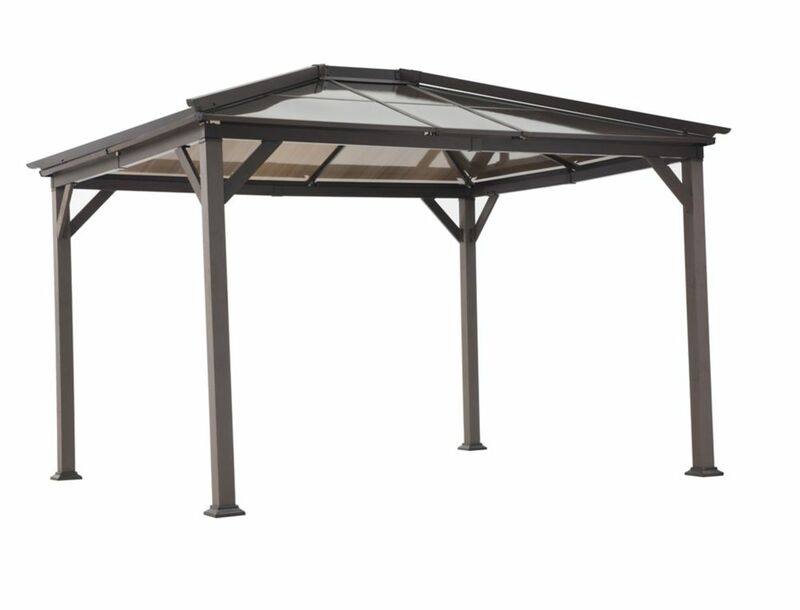 Turn your outdoor space into an oasis year-round with the Elgin Polycarbonate Top Gazebo. This gazebo has a durable, solid polycarbonate roof which allows soft light to filter through while keeping leaves, rain, and UV light out. A faux wood post with a functional hook in the centre can be used for lighting. This is your garden room for all four seasons. Add this gorgeous, soft-top gazebo to your backyard, patio or pool area for style, sophistication, and beauty! This gazebo has been designed to bring eye-catching style and function to your backyard entertainment space. That's right! You'll love the muted, red wine color of the large canopy. Decorative rails extend from each of the corner posts and help separate and define the space. Elgin 12 ft. x 10 ft. Polycarbonate Top Gazebo Turn your outdoor space into an oasis year-round with the Elgin Polycarbonate Top Gazebo. This gazebo has a durable, solid polycarbonate roof which allows soft light to filter through while keeping leaves, rain, and UV light out. A faux wood post with a functional hook in the centre can be used for lighting. This is your garden room for all four seasons.